Can you imagine a home where the silence is louder than the noise outside? Windows and doors have gone above the realm and serve purposes than they were originally designed for. Previously windows were designed for the purposes such as ventilation, letting in sunlight and keeping the intruders at bay, but with the advancements in the uPVC technology windows now have a varied range of advantages. These uPVC windows are lead-free, durable, high-wind resistant, waterproof, soundproof and burglar proof as well. Our windows are designed with special noise-resistant properties which reduce the noise up to 30-40 dB. This double -seal system allows acoustic control requirements in your home and keeps the noise outside. These small steps help the residents of the house keep their blood pressure and stress levels in control. Noise resistant windows are also known to be helpful during storms, high wind loads and torrential rains, as they keep the noise outside and do not let the water come in as well. Venster provides the most multi-chambered uPVC windows which are welded jointly to improve the overall sealing in your homes. 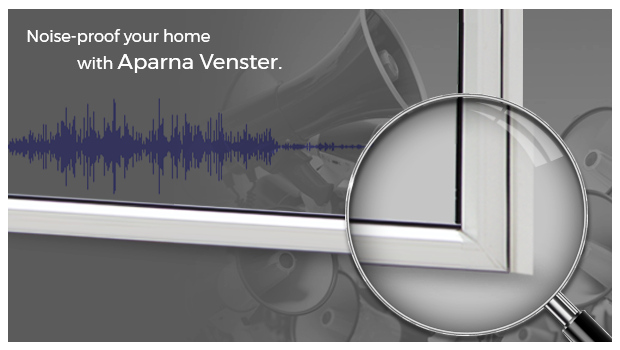 These are an added benefit to the already soundproof uPVC windows that Venster designs. Our uPVC windows can be fitted with varied thickness of glass windows such as double-glazed or laminated ones. These glasses not only keep the house airtight but they also can reduce the unwanted noise and sound manifolds. Our uPVC windows are installed very cautiously. In order to avoid unwanted gaps in the window frames and wall, there is the use of silicone sealants and gaskets in the installation process. This keeps the whole area completely sealed and does not allow any noise or dirt to enter the house. Our soundproof uPVC windows come with an additional feature of multi-point locking, they do not just improve the overall sealing but also enhance the sound and thermal insulation in homes. It will help you sleep peacefully in your home without the fear of being robbed or hearing loud noises. Want a quieter, cleaner and visually pleasing home? Explore here at – https://aparnavenster.com/ .